Back pain is one of the most common types of pain that people have. In fact, around 31 million Americans have experienced back pain at some point in their lives (study by the American Chiropractic Association). The chronic effects of back pain are certainly hard to endure, which is why we continuously seek ways on how to ease back pain. And one such technique is called inversion therapy. Inversion therapy is a non-surgical treatment where the patient is suspended upside down for several minutes to stretch the spine. The process works like spinal traction because the gravity decompresses the spine when the body is in an upside-down position. This eases the tension that accumulates in your back from long hours of being in an upright standing position, where the gravity pulls the spine downward, which compresses the spinal discs and vertebrae. By shifting the body’s gravity, your spine is stretched and relieved of pressure. Inversion therapy helps relieve back pain and sciatica, without the need for invasive procedures. Equipment used in this treatment is generally inexpensive, although it depends on your fitness level which type of tool is most suitable for you. For instance, gravity boots – ankle boots that allow a person to hang upside down by their feet – requires a great deal of athleticism on your part. This is also true for inversion racks, where the lower legs and feet are suspended and supported by metal racks hanging off a wall. An inversion table is the safest equipment that can be used by anyone regardless of their fitness level. It is a swiveling table that enables a person to hang securely upside down while the back rests on the flat table surface. It still allows you to stand upside down; only, there is more support for the entire body. Dating back to the 3000 BC, this practice is exhibited on stone seals that reveal the practice of inversion therapy during this time. By 400 BC, Hippocrates used the power of gravity by hoisting patients in an upside-down position to relieve ailments. In the 1960s, inversion therapy was popularized by an American medical doctor and chiropractor: Dr. Robert Martin. He used what he referred to as “Gravity Guidance System” to revolutionize the impact of the force of gravity on human health. Inversion therapy became widely accepted, and Dr. Robert Martin published his book detailing his program and the inversion table. This prompted companies to start the production of inversion tables. The 1980s saw the invention of gravity boots which also led to an explosion of sales. At the same time, more companies were joining in the manufacturing of inversion tables. It led to price tussles which saw some brands compromise on the quality of inversion tables in order to deliver a cheaper product. This resulted in a reduction in the use of inversion tables due to poor customer feedback and little medical research. Decades later, the reputation of inversion tables is back to its former glory. It builds on the ground of good health and long life. Through years of research, you can now trust that an inversion table is a legitimate way to help relieve your back pain. While clinical evidence has yet to fully conclude the effectiveness of inversion table therapy, people who regularly undergo the treatment swear by its results. Inversion table therapy is perfect for people who are looking for a non-invasive way to relieve chronic back pain. The decompressing effects on the spine and vertebral column allow proper stretching, resting of joints, and improving of blood circulation. Research on this treatment has found that after only 8 weeks of 3-minute inversion sets targeting different angles of the back, patients reported reduced back pain and discomfort, as well as improved lumbar and trunk flexibility. The stretching of the back area during inversion treatment has also been proven to alleviate spine-related problems. For instance, pain from scoliosis – a condition in which the spine is abnormally curved either due to genes or physical trauma – can be eased even by a few minutes on an inversion table. Another common spine-related condition is sciatica, or the inflammation of muscles and sensitive nerves caused by spinal disc compression. Patients can suffer painful sensations that can travel from the lower back down to the buttocks and legs. Inversion table therapy has been found to improve the space between the spinal discs, thereby restoring the spaces between vertebrae, which helps relieve disc inflammation. When discs are re-hydrated, this brings instant relief from debilitating nerve pains. Back pain is a huge problem for many adults, affecting the performance and capabilities of millions every day. In fact, it is the second most common reason that adults miss work, outnumbered only by respiratory infections. Inversion table therapy has been seen to help patients improve conditions like sciatica, disc disease, and lumbar osteoarthritis, and support their recovery toward fully functional lifestyles. Compared to mechanical traction (e.g., weights and pulleys), inversion table therapy is more effective in stretching vertebral muscles and decompressing discs. In a Swedish study exploring the benefits of inversion table therapy for people who are unable to work due to back pain, doctors provided 8 inversion treatment sessions to a total of 175 adults. And the results were astounding: close to 90% of all patients were able to return to work full time! Aside from easing pain, inversion table therapy can also lessen the need for surgery for people who want to be rid of back problems. Consistent practice of reducing compression for the spine not only helps patients deal with pain, but also prevents further damage and disability from back problems. A study found that almost 77% of patients who had serious lumbar issues and were initially scheduled for spine surgery no longer needed to undergo surgical treatment after using inversion table therapy. Practicing inversion therapy involves focused stretching movements on the spine and vertebrae. This not only relieves the back from compression, consistent therapy also helps make your body be more limber and gain a more upright posture. This can be especially helpful for most adults who spend their days mostly seated or hunched at their desk. In fact, a study measuring disc pressure in more than 100 individuals suggest that the only time one can fully rest the spine is when inverted. An upright or standing position produces 100% pressure for the spine, while reclining reduces it by half. Sitting (especially in poor posture) is one of the most compressive activities for the back, placing a whopping 250% pressure on your discs! What’s surprising is that even when a person is lying down, the disc pressure only loses 75% of the standing body weight, meaning lying on your back doesn’t fully relieve your spine of compression. The results of the study relate to inverting as a good way to release pressure from the spine. It indicated that an ideal technique to offset the effects of gravity and stretch the discs is to invert at an angle of 60 degrees. Think of the lymphatic system as a drainage system for your body, as vessels drain foreign material into the lymph nodes where the immune system cells can deal with toxins and other harmful organisms. Lymph nodes also facilitate fat and nutrient absorption in the digestive system. Exercise is the best way to maintain your body’s lymphatic functioning. With inversion table therapy, you get a good dose of much-needed body training. In an inverted position, the entire network of lymph vessels are stimulated, bringing blood and oxygen to the tissues and boosting movement of the lymph nodes. How inversion table therapy affects the lymphatic system translates to the body’s overall immunity. As it stimulates lymph functioning, most of the body’s toxins are flushed out. The immune system can then focus on aggressively fighting infections, instead of being compromised due to internal toxins and impurities. Inversion table therapy really is a whole-body treatment. Its benefits are not only experienced in the back region, but also in one’s lungs! In the typical upright position, oxygen enters the lower lungs easily. In an inversion treatment, the upside-down position encourages deeper breathing. To get the air to reach the lower lungs, a stronger breathing technique is needed. This strengthens the diaphragm muscle, which draws air to your lungs. And improved breathing will ultimately get more oxygen to all the vital organs of the body. Giving your body the opportunity to be upside down from time to time can also support your digestion. How? Well, inversion table therapy enables body waste to move more efficiently from the small to the large intestines, cleansing the digestive tract and encouraging bowel movement. So, along with a host of other body parts, inversion therapy directly benefits both respiratory and digestive systems. Inversion therapy can be a great way to reduce headaches and migraine symptoms. The process of putting the body upside down not only decompresses the back, but also increases the blood flow to the brain. As a result, oxygen floods the brain cells, which can prevent mild or intense headaches. A New York specialist has found that oxygen can indeed be an effective therapy for cluster headaches. He said that exposing migraine patients to increased levels of pure oxygen has led to some relief for the patients. It then follows that there is a potential for inversion therapy to relieve headaches, although more definitive studies are needed to really confirm its impact. 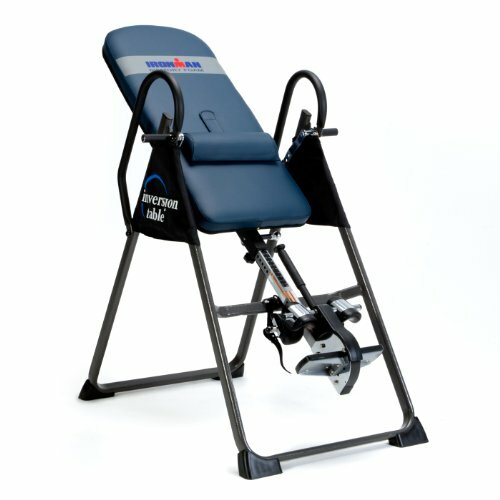 The top-performing Inversion table brands include Teeter, IRONMAN, Health Max Pro, and Health Mark. A world-renowned Inversion Table brand, Teeter has been around since the 1980s. Their Teeter inversion table is an FDA registered device. Along with inversion tables, this company also produces other exercise products for the commercial and home markets. This brand produces premium inversion tables that are more expensive that other inversion table however their quality is top of the line and they are the only FDA registered maker of inversion tables. This brand is also influential in the production of inversion tables. Their products meet the needs of the consumer market but at an affordable price. This fitness line appeals to everyone who wants value in their products. As such, you should expect total satisfaction from buying from the IRONMAN brand. If back pain is keeping you from leading a healthy life, you will love the idea of non-invasive health technology using the IRONMAN Gravity 4000 Inversion Table. This model caters to you if you are a heavy user suffering from back pain. It can accommodate up to 350 pounds, and it has amply padding to help alleviate pressure on your back and body. With a wide tubular steel frame, this inversion table is built to last. The steel frame has a powder coating making it scratch and rust resistant. You can expect to use this model for many years without a hint of age. The steel frame is also an assurance of the weight it can hold up as it is sturdy metal. 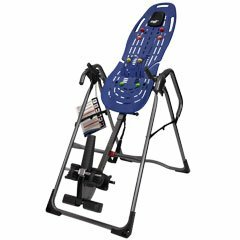 This inversion table is excellent for users up to 6ft 6 inches tall. You will love lying on the backrest since it is extended, and it comes with a lumbar pillow. Memory foam vinyl is used in the cover. It gives you a comfortable space while the lumbar pillow supports your low back. You can always remove the lumbar pillow if you don’t need it. IRONMAN 4000 is your go-to if you are looking for full inversion. It can invert to 180 degrees, but it provides two other inverted settings to suit your desires. For a cheap inversion table, you will find the safety handles well-built for a safe return to the initial position. You will also love that it has a patented locking system using its ratchet ankle holders. The ankle cushions are ergonomically molded to contour to your ankles. Not to mention, this locking system is palm activated and is adjustable. And when you are through with your inversion therapy, it folds neatly for storage. Measuring 26 x 17 x 80 inches when folded, the IRONMAN 4000 is a good space saving design. It is quite easy to assemble as it comes with the all the tools you need for assembly. You can take less than one hour when you follow the instructions manual. IRONMAN Gravity 4000 gives you a free 5-year limited warranty. Read our Ironman Gravity 4000 review. Perhaps one of the best performing inversion tables, Teeter uses precision engineering to give you a model that you can use for a variety of reasons. If you suffer from back pain, have a herniated disc, muscle spasms, muscle tension, sciatica, facet syndrome, degenerative disc disease, and spinal stenosis, this inversion table is for you. A unique aspect of this inversion table is that it comes with acupressure nodes. These nodes work hand-in-hand with gravity when you invert to cause traction to your spine and stretch the paraspinal muscles. It helps bring relief to many conditions that affect us concerning our muscles and the back. Specifically, for the lower back, there is a lumbar bridge that comes in handy to stretch the muscles in the lower back fully. The Teeter EP-560 uses an exclusive ComforTrak Bed. It goes away from the traditional padded inversion table to enhance the decompression process. As you will notice, it keeps your body from sinking into the bed which results in faster traction. This means you don’t have to use it for more than 5 minutes per session as you will be feeling better even after only a 5-min time lapse. The handholds explore a grip-and-stretch design to complement the decompression process. You will also love the adjustable tether which gives you rotational control and adjustability. The ankle support system provides all-around ankle support which lessens the pressure to the ankles. Furthermore, the foot platform is adjustable so that it can accommodate wide feet. You have eight acupressure nodes arranged at varied heights. They provide focused relief and trigger point release. 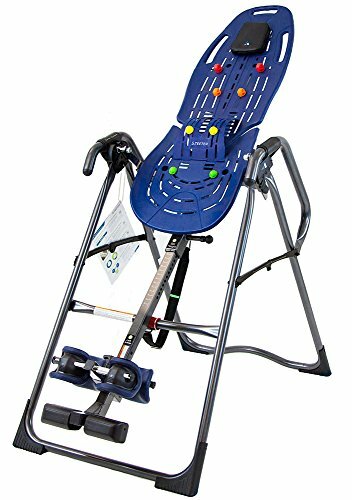 When used along with your body weight and gravity, this inversion table offers natural relief from painful conditions. It lessens muscle tension and improves flexibility. Now you can achieve a natural posture without trying too hard. However, it does not support performing of any exercises like ab crunches. For the money, we can say you are getting the best features on a premium model. Teeter has the easiest assembly process of all the inversion tables we reviewed. It typically takes only 13 minutes using five steps to complete the assembly of a teeter table. This is because it arrives almost all preassembled all you to do is apply the finishing touches so that you can start your inversion therapy right away. Ultimately, it offers you space-saving storage since you only need to fold it up and do not need to remove or disassemble any part of it for storing. You can count on Teeter to stand by their products. The EP-560 has a 60-day money back trial and is supported by an extended 10-year guarantee. Read our full Teeter EP-560 review. Living a healthy life is often inhibited by pain in our bodies. Get your groove back with the Teeter EP-960 Inversion table. Built to restore your back and painful muscles, you are up to the most comfortable and natural method of back pain relief. This inversion table utilizes high-grade parts that include steel and a ComforTrak bed. Eight acupressure nodes complement it. With the extra-long handles, your stretch is maximized for more decompression and a faster way of achieving pain relief. You will love using the ankle lock handle as it provides quick securing for your ankles. It is an EZ triple lock system with an extended handle. It keeps you from bending when you want to reach out to secure your ankles. The ergo embrace supports wrap around the ankles so that pressure is well-distributed. It helps the heels feel comfortable so that you will not end your session because of any build-up of pressure in your ankles or feet. An adjustable foot platform fits both small and wide feet the same. We like that it has an EZ-angle belt which gives you three adjustable settings from 20 to 40, and 60 degrees. The stretch max handles come in handy to allow for more stretching options by giving you an extra-long stretching surface. 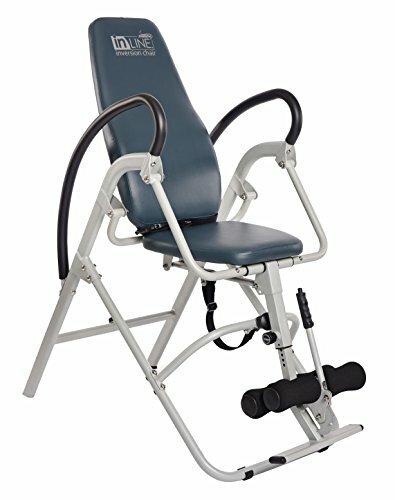 You can use this inversion table with a height from 4’4” up to 6’6” and with a weight of up to 300 lbs. At lesser angles, the decompression handles provide you with rhythmic oscillation when you press and release the handles. 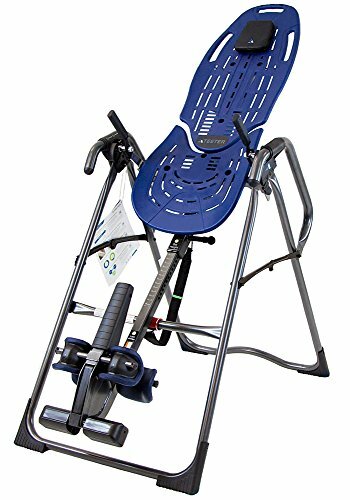 This is a premium inversion table and does cost more than most of the other models we reviewed but if you are looking for a top quality inversion table the Teeter EP-960 is a great choice. This product is certified to provide the pain relief benefits it claims. From lower back pain relief to relieving pressure on nerves, rejuvenating herniated discs, and re-aligning the spine. It is your go-to for natural pain relief from the comfort of your home. Like the Teeter EP-560, this model also assembles in 13 minutes. You will just be installing the handles and the main components which takes only five steps. Storage is also effortless since the frame folds compactly into 20 x 28.8 x 66 inches. Teeter supports this inversion tables with a 5-year warranty. Start enjoying a healthy life with this Teeter Inversion Table. The Health Max Pro inversion table takes versatility to the extreme. It is the only model that can invert in the face-up and face down position. It is also a distinct inversion table that is available for home use but with a massage therapy design. Everything about it speaks functionality in a device you will be happy to own. Health Max Pro is well-built to support up to 600 pounds. If you are overweight, you are familiar with pain from the added pressure, but you don’t have to fret since you can start feeling better on this inversion table. It gives you five working angles, and you can invert fully to 180-degrees without the need to support this machine. The face-down position allows reaching 180 degrees inversion where you can work with your massage therapist to enhance decompression. You can expect more blood flow to the back and traction to the spine which gives you the most satisfying pain relief. When it comes to safety and comfort, Health Max Pro explores rolled knee and thigh support and front and rear ankle supports that are easily accessible. The backrest is well-padded that you will find very comfy during inversion. You will also love the crescent face rest for both the face down and face up positions. With 25 height settings, you will find the usefulness of this inversion table at its best. Not only that, you can perform hyper back extensions and inverted crunches for improved blood flow and decompression. It is a device you will come to love and use it every day because of the health benefits associated with it. The frame assembly is straightforward looking from the manual. It has well-labeled parts which continue to show you the assembly process. For our estimate, it will take close to an hour to assemble this inversion table. Its full dimensions stand at 28 x 58 x 45 inches. It should not be a problem when using it in homes with lower ceilings. Health Max Pro provides a one-year warranty for this inversion table. Read our Health Mark Pro Max inversion table review. It does not support usage with some health conditions including high blood pressure. Teeter brings you yet another way to invert. With Teeter’s inversion kit paired with inversion boots, you can start inversion right away. It is the ultimate way to perform inverted exercises that you cannot do with most inversion tables. These gravity boots feature an ankle-lock system. It consists of a wrap-around design with construction from a pliable blend of DuPont Hytrel material. It is sturdy for durability, but it comes with interior foam to provide a soft landing for the ankles. This aspect minimizes pressure and the overall load to your knees. With a more comfortable load on the joints and knees, you can perform inverted exercises and increase the decompression process. You can crunches, sit-ups and many other exercises. The CV bar replaces the inversion table. You will not need to assemble anything. Just find a good place to hang the bar and you are ready to begin your inversion therapy. What’s more, this set also includes ratcheting self-locking fasteners that secure you to the CV bar. These gravity boots achieve unparalleled comfort owing to the distinctive design. From the interior foam to the hooks and calf loops, this pair promises durability and strength. This design comes in a universal size, but you can still get an XL size if you have large feet. We love that you can use these gravity boots with traditional inversion tables as well as with Teeter Hang Ups, and also some F-series tables. The gravity boots come with a 5-year warranty which a sure mark of reliability on Teeter. If you prefer to not use a traditional inversion table, you can still achieve the benefits of inversion with our best inversion chair. The Health Mark IV19600 Pro comes with some appealing features to help you through back pain and muscle relief. This inversion chair comes in an ergonomic design with a belt that allows inversion up to 70 degrees. It works to decompress the spine while in the correct inversion position; that is the knees sitting above the hip flexors. It helps to improve blood circulation to the spine which in turn results in stress alleviation to the lower back and along the spinal column. This inversion bench is padded, and it has non-slip feet. The back support and seat are also comfortable which allows you to invert for longer while harnessing the full power of gravity. 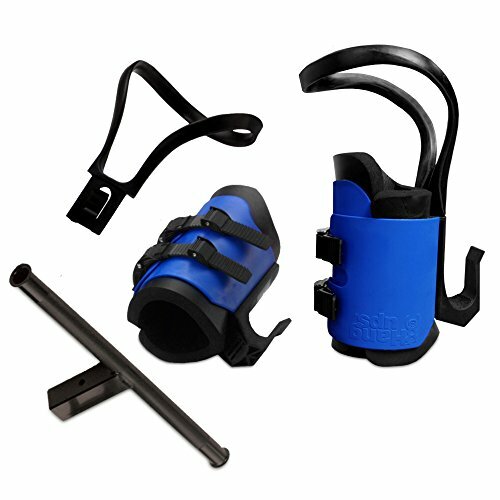 The safety features include a safety belt and foamy knee, and ankle clasps. When you are fully inverted on this inversion chair, you can perform inverted exercises that strengthen your core and contribute to a healthy back. This inversion chair is a remarkable device when you want full spinal decompression. It gives you assisted traction to help with lower back pain, muscle tension and spasms, and muscle fatigue. 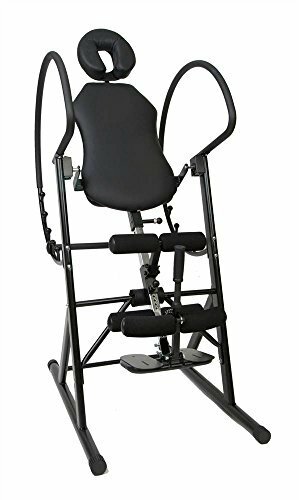 It is an excellent model for ab workouts which allows you to use the chair for multiple exercises as well as inversion therapy. It supports up to 300 lbs. Inversion therapy can be unsafe if you have certain conditions and is not right for every person. This is because it decreases the heart rate and increases blood pressure. Doctors also agree that it puts a significant amount of pressure on the eyeballs. If you have cardiovascular disorders (heart disease, high blood pressure, stroke), joint and bone disorders (spinal injuries, herniated disc, osteoporosis), and ear infections, glaucoma, and conjunctivitis, you should not use an inversion table. How long should you spend on an inversion table? Inversion is about letting the muscles release the tension. When you first start to use an inversion table, your body will resist being in the upside down position. As such, you should start by doing a 1-2 minute session and then work your way up to 3-5 minutes. It is more beneficial to do more inversion sessions than to spend more time on the inversion table per session. Are inversion tables useful with sciatica? Sciatic pain is experienced in the buttocks, low back and thighs. It is caused by a bulging disc that exerts pressure on the sciatic nerve. When you invert at a 45-60 degree. angle, it decompresses the spine and causes decompression to the intervertebral discs. This process, in turn, releases the pressure on the sciatic nerve and can be very beneficial for sciatica issues. An inversion table allows you to stand in an upside-down position. It is comfortable with persons from 4’6" to 6’6". Some inversion tables are great for exercises such as ab crunches and torso rotations as well. Inversion chairs also focus on stretching the muscles mostly on the back rather than on the legs and ankles. Instead of using a table, you will be using a chair and a strap to keep yourself from falling out of the chair. Inversion gravity boots are designed to provide full inversion in an upside-down position. They are used hand-in-hand with inversion tables and inversion bars that make it easy to quickly invert yourself and take up less space that inversion tables. 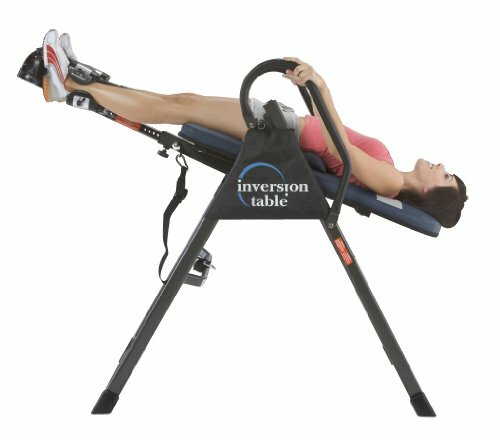 What about an Infrared Inversion Table? This type of inversion table uses infrared heat therapy in addition to inversion. The heat can get deeper into the skin without hurting the body. Infrared heat increases blood flow which allows the body to heal faster than when using traditional heating pads. It decreases stress levels which also contributes to the body’s healing process. If you have the extra money to spend an inversion table with an infrared therapy options is a great choice. With inversion table therapy, there are a myriad of opportunities to improve your body functions and wellbeing. The benefits shared here are only a few of a whole lot more that this treatment offers. Plus, inversion is less expensive than other forms of therapy. Find a clinic or a gym that has inversion therapy services or purchase an inversion table and do minor angle inversions at home. Keep in mind that there should always be someone to assist you when you’re on the inversion table. The best part about the therapy is that it only takes a few minutes to start showing results! 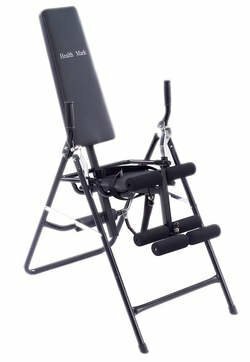 Our top performing is the Teeter EP-560 Inversion Table. It comes with intuitive features like the acupressure nodes and ComforTrak Bed. It is a durable machine that has your health in mind. You have no reason to be grounded when you can start living a fulfilled life without pain with the help of an inversion table.